Why does everyone stare at me in shul? My hair is furrier, fuzzier and a foot taller than everyone else's. Even among "my people" in the Dominican Republic, I am considered rather pale; but in a crowd of Ashkenazi Jews, people tend to see my measly tan as exotic. My skin color, my hair texture and my facial features all betray my desire to blend in. I only wish I could tell all the gawkers outright that, just two years ago, I was a non-practicing Catholic running around in cleavage-enhancing tank tops and short shorts. Why do people decide to convert to Judaism? It's a question that converts—especially those of us who don't aesthetically blend in—are asked incessantly over the course of our journey into Judaism. Many people make assumptions: "Oh, she's just doing it to marry a Jew." And for the non-Caucasian convert, the journey is complicated by race and ethnicity. I am Hispanic, a first-generation Dominican-American. I am black, white and Other. But being Jewish is what I identify with most of all, even though people can't see it. As the daughter of immigrants, I had only just realized that there were other options outside the mix of Catholicism and Santeria—Spanish voodoo—practiced in my home. Even living in Washington Heights, around the corner from Yeshiva University, I assumed everyone was also Catholic and had little altars at home where their mothers made offerings to saints. It took a visit from a Holocaust survivor, a trip to Yeshiva University's museum, and one excursion to the local library's religion section, and I was sold. After all, as a child in Sunday school, everyone had drawn Jesus when we were told to draw G‑d, and I had only squiggled my yellow crayon around and said "G‑d is light." The nun was perturbed. But I cringed whenever I heard "in his name we pray," or when I saw all the idols in church. It wasn't until after college, many non-observant Jewish boyfriends later, that I rediscovered Judaism. My best friend, a sworn atheist, had met a rabbi and gone Orthodox. Instead of freaking out, as many of his friends did, I asked him for books and websites, and when I told my family about it, my sisters said, "Well, great… didn't you always want to be Jewish?" At the beginning of a religious conversion process, there can be a startling and unexpected chain reaction—a change or loss of friends, a new vocabulary, a new wardrobe and a less than supportive family reaction. "So, who are you converting for?" "No, really? Don't you believe in Jesus?" "I'm sure someone will marry you even though your hair is… nappy." And then there are those crowds of Jews, who—like some friends and family—simply don't understand who they've encountered in meeting me. The encounters of converts testify to their tenacity and dedicationAlthough the American mainstream has largely accepted Jews as white, an increasing population of non-Caucasian converts is adding brown, black and yellow to the American Jewish milieu. My Muslim, African-American student, Reggie, break-danced with rabbis at my wedding and discusses Talmud with my husband, a rabbinical student. My aunt, always full of questions about Judaism, loves to tell those around her about her Orthodox Jewish niece. She wonders after speaking with a non-observant Jew, "Why call yourself Jewish if you're not doing anything Jewish?" Do Jews who negatively react to my skin color forget that they were once slaves in Egypt and strangers in another land? Sticking out like a sore thumb in your own community — the only dark or different face in the crowd — is the struggling convert's reality. These new Jews are causing ripple effects, perhaps raising the bar as they change how non-Jews look at Judaism and Jewry. The encounters of converts testify to their tenacity and dedication to staying the course, despite absurd and frustrating obstacles. As more converts from dissimilar backgrounds join the fold, perhaps people will stop gawking at us in shul. If nothing else, it isn't very polite to stare. 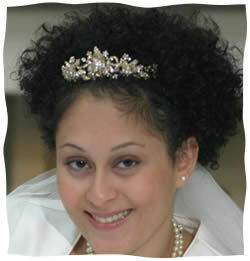 Aliza Hausman is a Dominican-American Latina and Orthodox Jewish convert (Jewminicana for short! ), freelance writer, blogger and speaker. Originally published in PresenTense Magazine. I am a 'ger tsedek' myself (first did Conservative 10 years ago but on the slow yet worthwhile path to Orthodox conversion). Only twice or so did people tell me I "look like I could be Jewish", but overall, I don't. I remember being in the Hebrew Language course in college and being looked at by all the Jewish students; I have a more "Western-European/French" look to me. Bit awkward to get those glances (but it also helped one of my Judaic Studies professors was a convert). I can only say that I get more of that "You don't look Jewish" from non-Jews. All Jews I know, including the older Israelis I met during my first Aliyah, and the ones I have bumped into at the Chabad Center (here in Beijing), are truly welcoming and warm. In fact, no stares or pops that line here at all in Beijing at this center; all I get is 'Chag Sameach' and "Shabbat Shalom' :) Goes to show that looks aren't everything. Whenever I attend an Orthodox (or Conservative) congregation in Houston, most of the "white" Jews look a lot like Aliza, and many others are black or Latina or Sephardic [middle eastern background). Aliza, you look like a normal Jew. I can't imagine who goes to your synagogue, that they would fail to see you as SO Jewish. I am so pleased with you, that you have chosen to live a Jewish life. funny, you don't look Jewish I like the author's frankness and positive outlook. Many converts turn inwards and feel sad when they face the same reality ,but Aliza's sense of humor and sunny disposition has made it a different experience for her altogether. There are Europeans who convert t become Jews, and since "white" means "of European extraction" that means that "white" Jews exist. But most Ashkenazic Jews have only a slight European heritage. Our Jewish heritage is Middle Eastern, which is to say, Asian. Jews tend to be Asian. But we have converts who are white, black, east Asian, and what-have-you. Is the big top photo your photo? If it is I'm not sure why fellow Jews would think you look "exotic", to be honest, with a photo like that you look very stereotypically "Jewish" to me (you in fact said you are "pale" compared to most Dominicans and I can see that). If fact you actually kind of resemble my mother in hair color and skin tone there, and as far as she knows she is 100% Ashkenazi Jew with parents from Romania and southern Russia (you also kind of resemble actress Mila Kunis, who is also Jewish from southern Ukraine by the way). The truth is, while most Jews are "white" in appearance I have found even in my own and my wif'e's family that we cover pretty much the whole range of "white". We both have relatives with the full "blond/blue eyed" look and relatives who could easily pass for Arabs or "pale Latinos" for that matter (in fact my mom has been asked in the past if she is Cuban or a lighter skinned Puerto Rican).